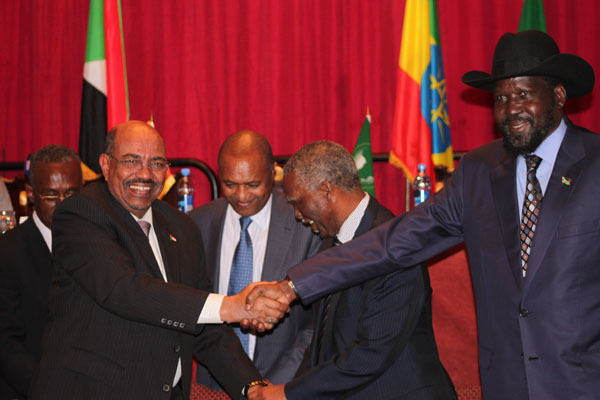 ADDIS ABABA, Ethiopia — Sudan and South Sudan signed a deal today that will resume oil flow and create a demilitarized zone between the two countries. However, a resolution on Abyei and border disputes was not included in the deal. In a signing ceremony at the Sheraton hotel today President Omar al-Bashir and President Salva Kiir expressed the will to cooperate in creating peace and stability between the two countries going forward. The agreement constitutes a “giant step forward for both countries,” said former President Thabo Mbeki, who led the African Union High-Level Implementation Panel that facilitated the negotiations. “The leadership in both countries is committed to the perspective that there shall be no more war between the two countries,” he said. On the unresolved issue of Abyei, Kiir called on the facilitating A.U. panel to refer the issue to the African Union Peace and Security Council. “We expect the A.U. PSC will find a solution to this impasse sooner than later so that the people of Abyei who have suffered and continue to suffer for so long can finally make a decision about their own livelihood and belonging,” he said. An A.U. Roadmap issued earlier this year called on the AUHIP to submit proposals on any outstanding issues after negotiations concluded. These proposals are “to be endorsed as final and binding solutions,” according to the statement. Bashir said his government affirms its commitment to the Abyei Protocol in the Comprehensive Peace Agreement, which calls for a final status referendum for the area’s residents to decide whether the territory falls in Sudan or South Sudan. The statement also called for further progress on ongoing conflicts in Sudan. Little progress was made to begin talks between the Sudan government and the rebelling Sudan People’s Liberation Movement-North on the conflicts in South Kordofan and Blue Nile. "Securing a deal between Khartoum and Juba is an important step towards stabilizing relations between two actors with a long history of war," said Enough Project Co-founder John Prendergast. "The peace is only sustainable if the international community pivots immediately and launches a process to resolve the festering civil war within Sudan as well as strategizing on ways to neutralize rogue Sudan-backed militias in South Sudan. Left unaddressed, all the hard work at the peace table will quickly be replaced by further death and destruction in the war theater."